The Monster Energy NASCAR Cup Series crowned a champion on Sunday at Homestead-Miami Speedway for the season finale. The Big 3 were the favorites heading into the championship weekend, but it was Team Penske’s Joey Logano that earned his first career series title. Three former champions and two young guns are featured in this week’s Top 5. No. 1 Ricky Stenhouse Jr. – Ricky Stenhouse Jr. has not earned a top-10 finish since earning third at Talladega, but that does not mean that the Roush Fenway Racing driver hasn’t been making gains. Stenhouse finished in the 16th position on Sunday at Homestead-Miami Speedway, his second-best finish in the last five races. Stenhouse failed to earn stage points, but ran as high as eighth at the 1.5-mile track and held a 14th place average throughout 400.5 miles. Stenhouse finished 18th in the point standings. No. 2 Matt Kenseth – Matt Kenseth earned his second top 10 of the 2018 season at Homestead-Miami during the Ford EcoBoost 400, finishing in the sixth position. Kenseth failed to earn stage points, but ran as high as second on Sunday. Kenseth finished 32nd in the point standings. The veteran driver ran a partial schedule for Roush Fenway Racing after five seasons racing for Joe Gibbs Racing. Kenseth currently has no plans for Monster Energy NASCAR Cup Series racing in 2019. No. 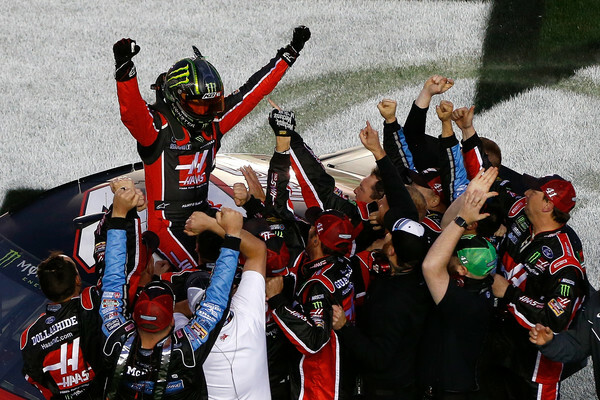 3 Kurt Busch – Kurt Busch earned his 22nd top-10 finish of the season on Sunday, finishing 10th. Busch gained stage points in Stage 1 (10th) and Stage 2 (seventh). He ran as high as fourth and held a ninth-place finishing average. The Stewart-Haas Racing driver’s finish is his first top-10 at Homestead since 2015. No. 4 Jimmie Johnson – Jimmie Johnson’s last race with longtime partner Lowe’s was a throwback to the seven-time champion’s rookie season. Johnson finished in the 14th position on Sunday. The Hendrick Motorsports driver failed to earn stage points in Stage 1, but finished ninth at the end of Stage 2. Johnson finished 14th in the point standings, the lowest he has ever finished under the new playoff format. No. 5 Ryan Blaney – Ryan Blaney matched his best finish at Homestead on Sunday, finishing in the 17th position. Blaney failed to earn stage points on Sunday, but gained 12 positions from his finish at the track one year ago. The 24-year old’s first season with Team Penske earned him one win, eight top-five finishes, and 16 top 10s. Blaney finished 10th in the point standings. The 11th race of the Monster Energy NASCAR Cup Series at Dover International Speedway in Dover, Delaware saw a former champion earning his fourth win of the season. One young gun overcame obstacles to tie a career best, while another veteran earned his best finish at Dover in three years. Only two organizations are featured in this week’s top 5, but all improved their positions from one year ago by more than 10 positions. No. 1 Clint Bowyer – Clint Bowyer was in a good position on Sunday to earn his second victory of the season, but a rain delay halted the Stewart-Haas Racing driver’s momentum that ultimately ended in his runner-up finish. Bowyer was leading on Lap 320 when NASCAR red-flagged the AAA 400 because of rain, but when the race resumed it took teammate Kevin Harvick just eight laps to get around Bowyer. Bowyer finished second to earn his third top-5 finish of 2018. He led 40 laps and earned stage points in Stage 1 (seventh) and Stage 2 (fifth). Bowyer sits fourth in the points standings, 86 points behind leader Kyle Busch. No. 2 Kurt Busch – Kurt Busch was relatively quiet at Dover despite his fifth place finish. Busch finished Stage 1 in fifth and failed to finish inside the top 10 during Stage 2 of the event, but had an average position of ninth throughout 400 miles at the one mile track. Busch sits sixth in the standings, 108 points behind his brother. He is only seven points behind Brad Keselowski in fifth. No. 3 Ryan Blaney – Ryan Blaney earned his sixth top 10 of the season despite battling issues. Blaney started in the 14th position and worked his way into the top 10 before the end of Stage 1, all while saving fuel. Blaney fought a tight car throughout Stage 2, but finished in the eight position. The Team Penske driver tied a Dover career best finish by earning an eight-place finish on Sunday. Blaney now sits seventh in the point standings after 11 races, 120 behind leader Busch and 119 from fifth. No. 4 Aric Almirola – Aric Almirola gained 14 positions from the fall event in 2017, finishing 11th on Sunday for his best finish at the track since finishing fifth in 2015. Almirola, who did not race at Dover’s spring race last year because of a back injury sustained at Kansas two weeks earlier, ran as high as fifth on Sunday. Almirola was 13th by mid-race and had a 15th place average. Almirola sits 11th in the point standings, 162 points behind the leader and three points behind Kyle Larson, who sits in the 10th position. No. 5 Joey Logano – Joey Logano gained 12 positions from one year ago, when he finished 25th. Logano started in the 18th position on Sunday and was just outside the top 10 by Lap 22 of 400. Logano earned stage points in Stage 1 (ninth) and Stage 2 (10th). After many adjustments to the Shell-Pennzoil Ford, Logano made his top 5 appearance at Lap 274. Logano pitted after the red flag for rain was lifted, but was forced to pit again with loose lugnuts. He finished in 13th place. The finish marked the second time this season in which the No. 22 has finished outside the top-10. Notable: Kyle Busch finished in the 35th position after the drive shaft on the No. 18 Toyota broke on Lap 272. Busch previously reported a problem on Lap 3. He still retains the points lead by 22 points over Logano and 40 points over race winner Harvick. The West Coast Swing continued in Avondale, Arizona at ISM Raceway on Sunday, March 11th for the TicketGuardian 500, where a familiar face earned his 40th career victory. A rookie scored his best finish, while his teammate scored the first top-5 of the season for the organization. Two organizations put all four of their teams inside the top-10, one for the first time in the organization’s history. No. 1 Chase Elliott – Chase Elliott earned a third-place finish after running inside the top-10 majority of the day. The Hendrick Motorsports driver scored the first top-5 in 2018 for the organization. The team has failed to find speed to compete with the Fords that have dominated and competed for the top positions so far this season. Elliott, who finished second one year ago, earned stage points in Stage 1 (third) and Stage 2 (ninth). Elliott is tied with Alex Bowman in the points standings for 16th, 77 points behind points leader Kevin Harvick. No. 2 Daniel Suarez – Daniel Suarez finished eighth at ISM Raceway, his best finish of 2018. The Joe Gibbs Racing driver ran as high as fifth throughout 312 laps. He gained ten positions from his 18th place finish one year ago. Suarez sits 22nd in the points standings, ahead of veterans Jimmie Johnson, Jamie McMurray, and Kasey Kahne. No. 3 William Byron – William Byron earned his best finish to date after previous finishes of 23rd (Daytona), 18th (Atlanta), and 27th (Las Vegas). Byron led his first laps in the Monster Energy NASCAR Cup Series before finishing in 12th place. Byron led for 15 laps, Laps 195 through 209. Byron sits 21st in the point standings, 100 points back. Can the rookie better his finish on the third and final stint in the West Coast Swing? Byron has one top-5 finish at Fontana, a fifth place finish in the Xfinity Series in 2017. No. 4 Kurt Busch – Kurt Busch earned his second top-10 of the season with a tenth place finish at ISM. Busch led six laps in addition to earning the Stage 2 victory on Sunday. Busch, who has one career victory at the one-mile track, improved his finish by 11 places from 2017. Busch gained two spots in the standings. He now sits 11th, six points behind Aric Almirola in tenth, and -51 from Harvick. No. 5 Denny Hamlin – Denny Hamlin rebounded from a 17th place finish one week ago to earn his third top-5 of the season. Hamlin earned stage points in Stage 1 when he finished fourth, while his teammate Kyle Busch took home the stage victory. Hamlin led 33 laps in the final stage of the event before bringing his FedEx Freight Toyota home to a fourth place finish. Hamlin is the highest ranked driver in the points of this week’s Top 5. He sits sixth in the standings, 31 points behind. Notables: The teams of Joe Gibbs Racing and Stewart-Haas Racing both had all four teams earn top-10 finishes. It is SHR’s first time in history at the feature. Matt DiBenedetto finished in the 25th position after taking to social media earlier in the week for sponsorship. DiBenedetto had Zynga Poker sign on as a primary, while Hamlin, Harvick, and Darrell Waltrip were secondary sponsors.